very nice..a question on your packaging however..
we know that the Order type is an aggregate root, but we also know that the Customer type could also be an aggregate root (in another context).. This packaging scheme would seem ideal per aggregate (so that changing a table name is a single package change, adding a database column and new method would only affect 2 packages, etc)..but would end up with many dlls (which just means better change/configuration mgmt i suppose).. Given that packages are supposed to be units of reuse, how does that fit into your package schema (given that the Customer type crosses aggregate boundaries) if at all.. I do not duplicate the package diagram for each aggregate root. The packages called Interfaces, Infrastructure, and NHibernate are used by all. I often find this pattern repeating (Service->Domain; Domain Objects->Domain; Persistence->Domain & Domain Objects) between bounded contexts. I don’t often see the Customer class in a single bounded context. Rather, there is a different Customer class for each context, representing exactly the part it needs. When it comes to the “Customer Care” context, we see different rules around Orders, than in the “Online Shop” context. I don’t quite view packages as units of reuse, but rather as a tool for managing dependencies. You are not really saying that SRP is driving you to define interfaces and then to only have one implementation? This isn’t the way I read SRP at all, I read it as one reason for change. I also don’t see what you are suggesting as being the (only?) way to do interface based programming, in fact I’d argue its often silly to extract interfaces if you are 100% sure there will only ever be one implementation. From the term role here I’m thinking of it being a role in the role-responsibility sense, if so I again would say that if multiple concrete classes can sensibly fulfill a role then a common interface is definitely the way to go? The idea is not so much to do a “extract interface” refactoring, but rather to represent a use-case a concrete concept in code. Once that interface is there, we can do lots of useful things with it – for instance, different fetching strategies for different use cases. I’d also like to refine my statements a bit and say that if there were two (or more) concrete classes that implemented the same interface (role), then, by definition, you shouldn’t care which class you get. If you think the code HAS to care, then you probably have a role struggling to express itself. Completely, and I’m enjoying the series of posts relating to the topic (and thanks for providing the code example of how to apply it!). Hi Udi. Great articles all over the place. 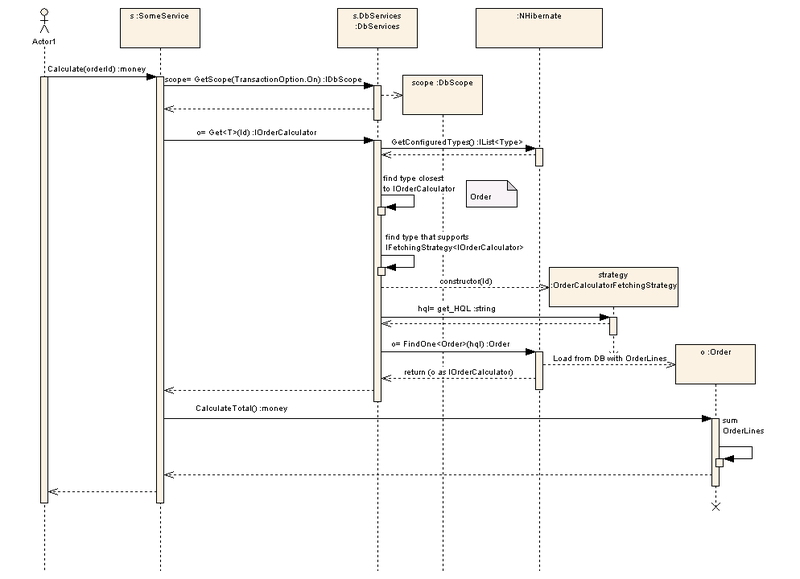 Now, I was wondering about the package diagram above. What kind of objects does your service layer deliver to the layers above? Objects from the DomainObjects package (or of course rather its interfaces)? Ok, I get that a CalculateCost-method returns a Money-object. But does a method like GetOrder return a Domain.IOrder? But these objects/interfaces are more than just DTOs aren’t they and have methods like Update and so on? Or would you create special Message Objects when the data moves across service boundaries to let’s say a web application? My service layer usually does messaging – those “special Message Objects” you alluded to (which are DTOs). I’ve Implemented the general Idea of what you’ve written here, my question is a bit on the technical side. I have a use-case in my app where I need the first two levels of my object tree. My xml files were omitted for some reason.. In domain driven design they suggest us to crate reach domain model. Therefore, first i will attempt to put the behavior on Order object to calculate Total cost. If you create a Role interface IOrderCalculator then who will implement it ? Is it the same ORDER class ? If Order class will implement it then somewhere I read that ENTITY never implements any interface or multiple interfaces. 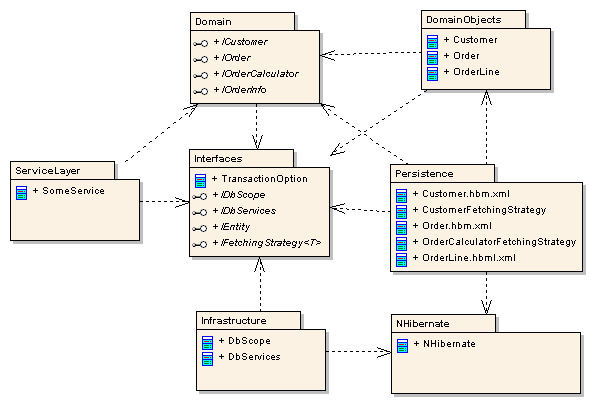 OR if some other object (OrderCalculator) implements the ROLE then our ORDER class wont have behavior and will become an anemic domain model. And what is the other object (OrderCalculator) is ? Is it an aggregate ?Could you please explain ?